The same CerAnode high quality MMO impressed current anode with a <100 micro ohm connection resistance PREPACKAGE in calcined petroleum carbon backfill, ready to be put in place. Canister anodes can be used for various applications such as underground and aboveground storage tanks and along pipelines. 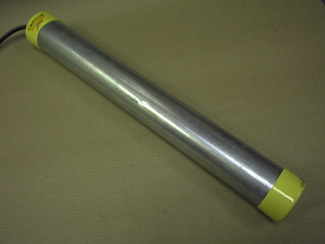 Standard steel can size 3” x 60” – other sizes available. Prepackaged Sock Version also available.